Networking groups need new members to florish. It’s key to convert visitors into members. Elementary tools will help your hosts with optimizing their approach to the visitors and their follow-up -and at the same time raise hospitality-awareness throughout the group. The challenge is to boost the conversion. See how this simple feedback form provides a communications channel that will boost your conversion rate! Print & cut = ready! How cool is that? 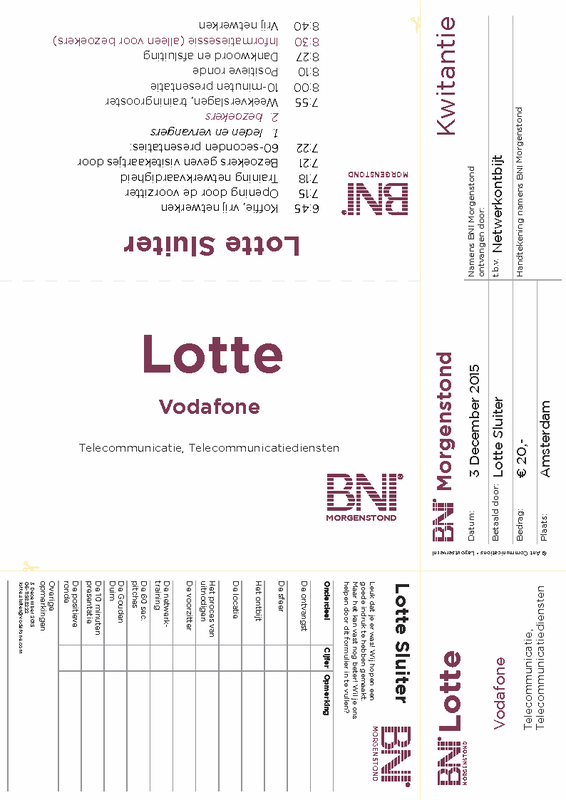 These are examples of the placemats and visitor kits, generated by layoutserver, based on the unique design concept by Ant Communications. The smart layout engine is fed by one copy/paste action from your side and harvesting publicly available data. 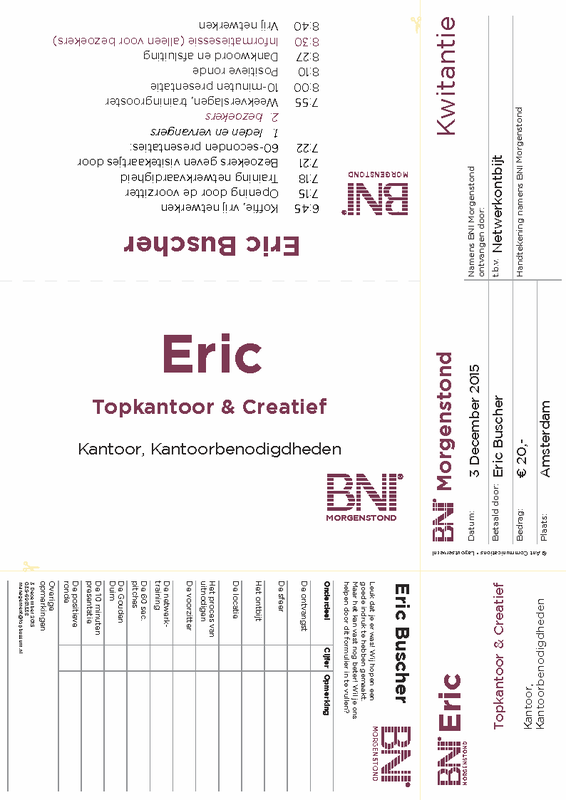 Dutch BNI chapters are currently using it. They generate all required materials with a single mouse click, smoothing their hosts tasks and thus boosting their chapter growth. Quick test? Type in your First name and click OK! Strategical seating with commonly used anonymous ‘Visitor’-signs will help to avoid that visitors are sitting next to each other. That way, a member is always at hand for explanations whenever questions arise. But there’s much more to achieve with a personalised table card. Questions are often about the agenda. Displaying it clearly will answer many questions without being asked. Personalised table cards allow both hosts and members to reserve their seat next to a visitor who they find interesting. That way it is easier to make the first contact. The personalised card also demonstrates to the visitors that they are expected and a seat is reserved especially for them. Visitors will be pleased that it’s indicated where to take a seat: everything is taken care of in a professional manner. The backside of the card shows the agenda. This helps the visitor to understand what the meeting is about and how well structured it is. Better ‘framing’ will result in a positive attitude and less questions during the meeting. 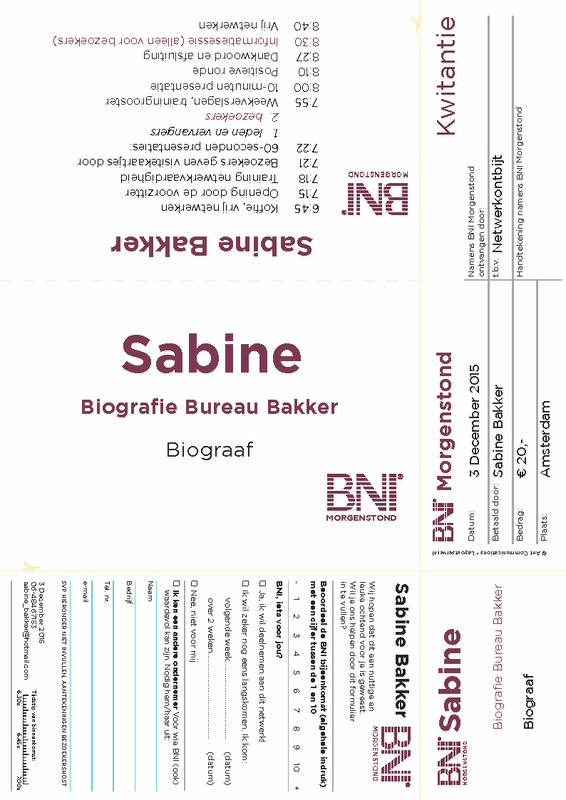 Make a free table card now! Each visitor has a reserved seat. You can choose carefully next to whom you’re going to take a seat! 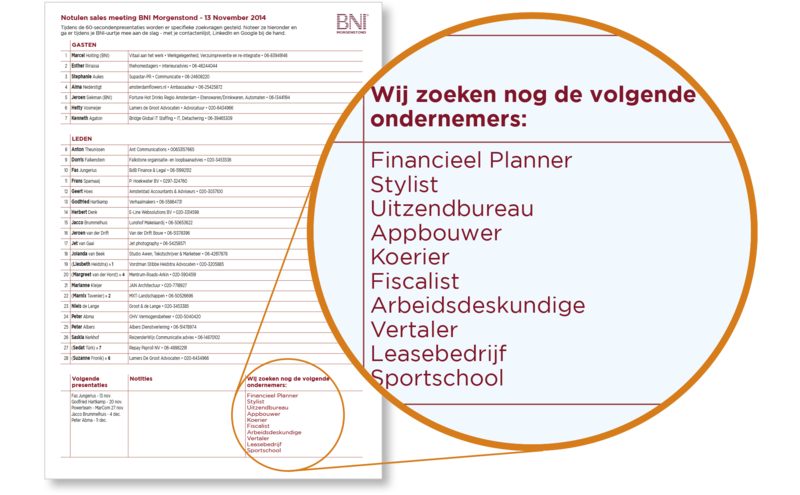 The examples shown are from Dutch chapters of the acclaimed BNI organisation. 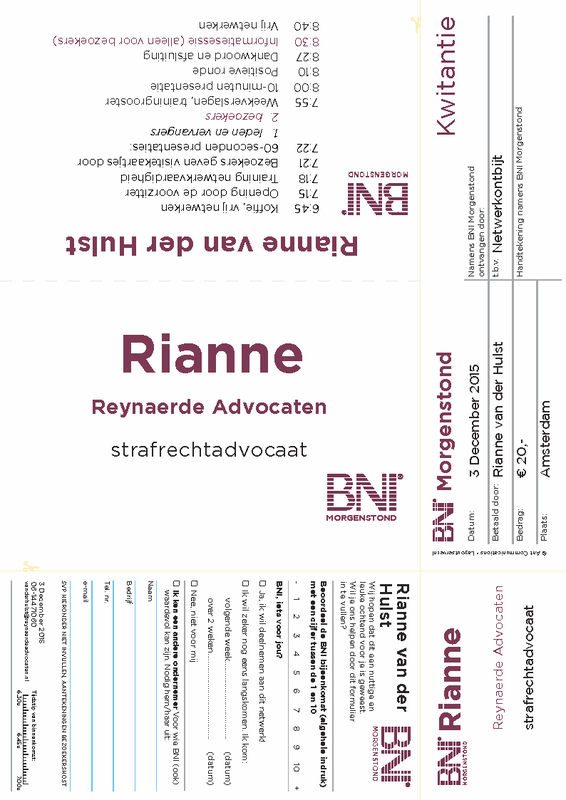 BNI stands for ‘Business Network International’ and is globally acknowledged for setting the standards in the world of networking and referral marketing. Show your guests that their important visit is well prepared. A personalised designer badge will demonstrate your professionalism. Display your visitor’s name clearly for maximum approachability. Make sure that everybody is carrying a badge. Never use business cards for that purpose; they’re not readable from speaking distance. It’s important your guest can always be called by name without hesitation. It will also save time especially in noisy environments (“Sorry, didn’t get your name?”) and it will make it much easier to let the visitor feel comfortable and blend in. If the badge also shows a company name and/or profession it’s even easier to start the appropriate conversation, asking the right questions. Connecting a visitor to an interesting member is so much easier with a descriptive badge! You could use handwritten stickers or cards but these will never have the same impact as a well-prepared personalised printed designer badge – preferably in your house style. TIP: Be sure to wear the badge on your right side for optimal visibility when shaking hands. Make a free visitor badge now! The perception of your professionalism is set in the first few minutes. So don’t waste time with filling in receipts. After all, you knew everything on beforehand: name, date, sum, location. Instead of scribbling on a block as shown on the right and asking how to spell the visitors’ name, just sign the receipt, hand it over and welcome the guest with a tasty cup of coffee. Guests can arrive quite late. Every minute that a guest is not able to experience what your event is about is wasted. In the ‘free networking time’ prior to the actual event valuable contacts can be made. TIP: If you hand over the badge first, you will probably get a compliment. It’s easy to change the subject to the payment after that! No scribbling, no spelling mistakes: prepare your receipts well. A real time saver in those precious pre-meeting minutes. Create your free receipts now! The displayed examples are from a Dutch chapter of the acclaimed BNI organisation. BNI stands for ‘Business Network International’ and is globally acknowledged for setting the standards in the world of networking and referral marketing. 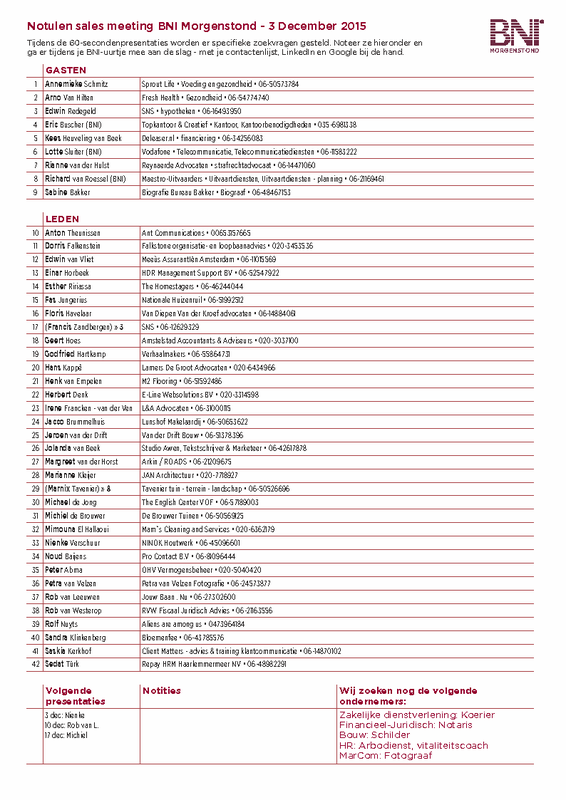 If the lists do not fit on one page, the system will make a page-fitting neat layout over two pages. The text on the feedback form is static due to layout requirements. If you send your translation by e-mail we’ll place it for you for free, including one correction round. The MEMBER list will be shown automatically. You will be able to adapt the title, the intro text and the last two sections (bottom part, 10-min presentations and open classifications). Just paste the VISITOR list that you copy from BNI Connect. You’ll need it anyway to make the kits. You will have to upload your own member list, exactly as exported from BNI Connect. The instructions are on the batch-publish page. A default grid for taking notes will be at the bottom of the page, no classifications or upcoming events – which is a shame because your visitors are taking the sheets home with them. Conversion slips can also be customized per group or chapter. Ask for the possibilities. Would you like to come back and if so, when? Do you happen to know somebody who you would recommend BNI to? This last question can generate additional visits. Still it’s often omitted. The host collects the slips with the valuable feedback. No risk of mix-ups. No need to remember who said what, no need to annotate during the talk: just focus on the visitors. The slips are date-stamped and personalised so they carry the name and the contact info of the visitors along with their answers to the vital questions. Following up is easy. Make your free conversion slips now! Some guests may have no interest at all to come again for a next visit (you can see that on their response slips). Take them apart and ask if they answered the last question on the slip about the recommendations. A reason for lack of interest can very well be that they already have a huge network – or at least they say so. Especially in such a case people are often more than happy to recommend new possible visitors. After that, encourage them to go back to the meeting room to rejoin the ‘free networking’ – they’ll appreciate it. The closing goal for a First Time Visitor will often be: ‘please visit us again next time’. A Second Time Visitor can also come again – after filling in the registration form. Of course these rules will differ per organisation or group but the principle remains the same. Whatever the rules are: the slips help the hosts to keep track of all visitors. The questions on the form are not the only subjects that a host can or must bring up in the evaluation. Dedicated trainings will teach the hosts about do’s and don’ts. But at least they have a tool they can rely on. 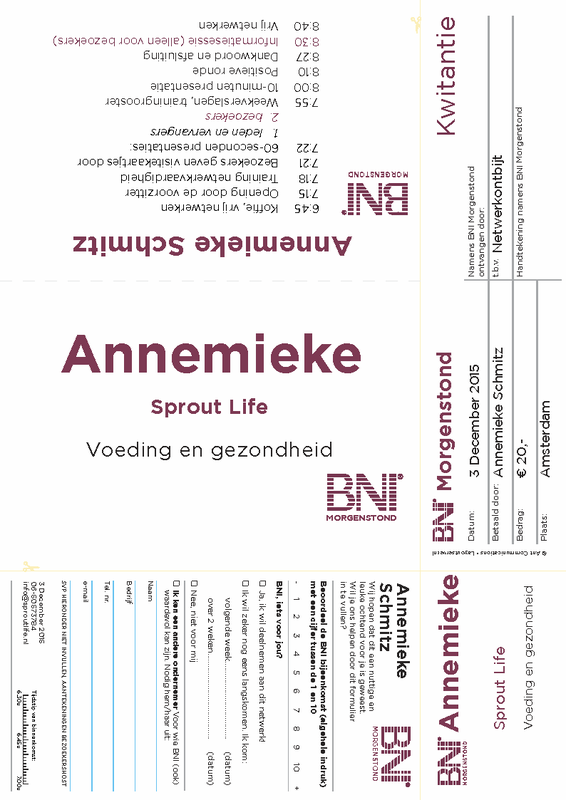 Currently a yearly subscription for this service is € 240,- (approx $275). Core groups 50% off until launch. Prices will go down when more chapters join. Free trial for a month. This period is currently extended to 6 weeks, no credit cards involved, but you’ll need to enter your e-mail address so we can contact you for evaluation. After a month of repetitive use I will be in contact to see if you’re interested to continue using our service. Conversion trainings / workshops on request. The power of personalized communication is documented in scientific studies, marketing tips, DM-experiments etc. (People even heal better with a personalized treatment.) Click here if you need to be convinced about the converting power of personalisation. Is it just online content where personalization works? Of course not, but it was simply never feasible in print! Now it is… Exclusively for you! Not at all. It’s less than € 5,- per weekly meeting. After all, how long can a graphic designer be copy/pasting for € 5,-, assuming he steals the concept? Of course, you pay for the idea, too. Just try it out for a few meetings. If your chapter never put serious effort in this kind of collaterals, it will definitely cost you a few minutes extra from your time. If the chapter decides that they don’t want to become a customer of this service, nothing needs to be paid. In case you change you change your mind (and I sure hope so ;-), please contact me. “Converting Visitors into Members” is a great piece by Ian Cooper, Islington Chapter Director, North London. 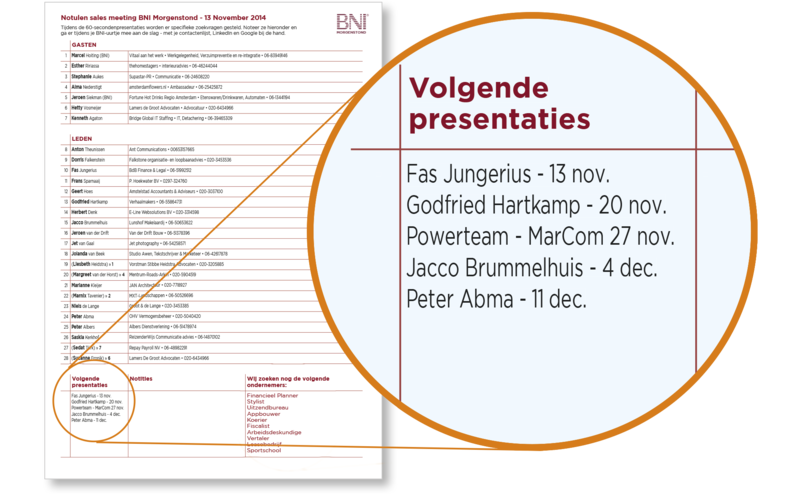 Source: BNI’s Succesnet. Recommended read! Joining a BNI is a big commitment. Make it easy for your visitors. Do all the things suggested here and you’ll be more likeable so that they will want to spend a morning every week with you.